Anarchism in Japan dates to the late 19th and early 20th centuries. The anarchist movement was influenced by World War I and World War II, in which Japan played a major role. The anarchist movement in Japan can be divided into three phases: from 1906–1911, from 1912–1936 and from 1945–present day. 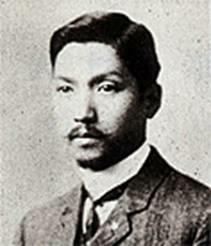 Anarchist ideas were first popularised in Japan by radical journalist Shūsui Kōtoku. After moving to Tokyo in his teens, Kōtoku became a journalist and by 1898 he was writing for the radical daily Yorozu Chōhō (Every Morning News). His liberalism led him to social democracy and Kōtoku attempted to form the first Japanese Social Democratic Party in May 1901. His fledgling Social Democratic Party was immediately outlawed and Yorozu Chōhō shifted away from the left so Kōtoku started his own radical weekly, Heimin Shinbun (Common People’s Newspaper). The first issue appeared in November 1903 and the last was published in January 1905. Its brief tenure earned Kōtoku a brief prison sentence from February to July 1905. In prison he read Peter Kropotkin's Fields, Factories and Workshops, and following his release he emigrated to the United States, where he joined the Industrial Workers of the World (IWW). Kōtoku claimed "had gone [to jail] as a Marxian Socialist and returned as a radical Anarchist." In the US, more than 50 Japanese immigrants met in Oakland California and formed the Social Revolutionary Party. The party began publishing a journal entitled Kakumei (Revolution) and a leaflet called Ansatsushugi (Terrorism) news of which reached Japan and angered officials there. Kōtoku returned to Japan in 1906 and spoke to a large public meeting, held on 28 June 1906 in Tokyo, on the ideas he had developed while staying in the USA (mainly California) which were largely a mixture of anarchist communism, syndicalism and terrorism developed from reading such books as Kropotkin’s Memoirs of a Revolutionist and The Conquest of Bread amongst others. At the meeting, Kōtoku spoke on "The Tide of the World Revolutionary Movement" and soon began writing numerous articles. While Kōtoku was in the US, a second social democratic party was formed called Socialist Party of Japan. A meeting of this party was held in February 1907 to discuss Kōtoku's views which ultimately led the party to striking the party rule which dictated working "within the limits of the law of the land". Five days later, the Socialist Party of Japan was banned. In 1910, Akaba Hajime penned a pamphlet entitled Nômin no Fukuin (The Farmers’ Gospel) which spoke of creating an anarchist paradise through anarchist communism. His criticisms of the Emperor in the pamphlet cause him to go underground but eventually he was caught and imprisoned. He died in Chiba Prison on March 1, 1912. The same year as the publication of The Farmer's Gospel, four Japanese anarchists were arrested following the discovery of bomb-making equipment. This caused a government crackdown on anarchists which culminated in 26 anarchists being charged with plotting to kill the emperor. The trial was closed to the public and all were found guilty. In 1912, Noe Itō joined the Bluestocking Society and soon took over production of the feminist journal Seitō (Bluestocking). Soon Itō was translating works by anarchists Peter Kropotkin and Emma Goldman. Itō met and fell in love with Sakae Ōsugi, another Japanese anarchist who had served a series of prison sentences for his activism. Ōsugi began translating and publishing Japanese editions of Kropotkin's Mutual Aid: A Factor of Evolution and Memoirs of a Revolutionist while being personally more influenced by the work of Mikhail Bakunin. Inspired by the Rice Riots of 1918, Ōsugi began publishing and republishing more of his own writing such as Studies on Bakunin and Studies on Kropotkin. The Girochinsha (Guillotine Society), a Japanese anarchist group haling from Osaka, were involved with revenge killings aimed at Japanese leaders during the mid-1920s. Nakahama Tetsu, an anarchist poet, and member of the Girochinsha, was executed for his activities. In 1923, Japan was hit with the Great Kantō earthquake. With more than 90,000 dead, the state used the turmoil as an excuse to round up Itō and Ōsugi. According to writer and activist Harumi Setouchi, Itō, Ōsugi, and his 6 year old nephew were arrested, beaten to death and thrown into an abandoned well by a squad of military police led by Lieutenant Masahiko Amakasu. According to literary scholar Patricia Morley, Itō and Ōsugi were strangled in their cells. This was called the Amakasu Incident and it sparked much anger. In 1924, two attempts were made on the life of Fukuda Masatarô, the general in command of the military district where Itō and Ōsugi were murdered. Wada Kyutaro, and old friend of the deceased, made the first attempt shooting at General Fukuda but merely wounding him. The second attempt involved bombing Fukuda’s house, but the general was not home at the time. After the end of the war, Japan was under the effective rule of the United States. Heavy investment and a rapidly growing economy were accompanied by a clampdown on trade union autonomy. Although the anarchists re-organised, they found it difficult to flourish in these conditions. Japanese anarchists cooperated, and supported Korean anarchists. Bak Yeol was its editor-in-chief. ^ a b c d e f g h i j k l m n o "1868-2000: Anarchism in Japan". ^ a b c d e f g h i j k l m n o p q r s t u v w x y z aa ab ac ad Crump, John (1996). "The Anarchist Movement in Japan, 1906–1996". Anarchist Communist Editions ACE Pamphlet (Pirate Press) 8. ^ Shiota, Shôbee (1965). Kôtoku Shûsui no Nikki to Shokan [The Diaries and Letters of Kôtoku Shûsui]. Tôkyô: Mirai. p. 433. ^ a b "A Brief History of Japanese Anarchism". Anarchy in Nippon. Retrieved Aug 19, 2013. ^ a b "Noe, Ito, 1895-1923". ^ a b c d e "Sakae, Osugi, 1885-1923". ^ Setouchi, Harumi (1993). Beauty in Disarray (1st ed.). Rutland, Vermont: Charles E. Tuttle Company. pp. 18–19. ^ Morley, Patricia (1999). The Mountain is Moving: Japanese Women's Lives. University of British Columbia Press. p. 19.